Death of a Pancreas: Team Elise... in Portugal! The picture to the left is of a good friend of ours, Tiago. 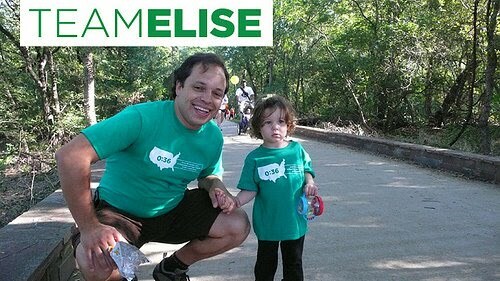 Fred met him a number of years ago in New York, and he has been an amazing supporter of Team Elise from the very beginning. Last year, he surprised us by flying in from New York so he could do the walk with us. Unfortunately, Tiago has moved back to Portugal, but is still very much a part of Team Elise. On September 25th at 3:00 pm (the exact date and time of the walk here in North Texas), he will be walking in Lisbon. He had some shirts made up, raised sponsorship money, and is rallying his friends to come join him. Fred and I cannot thank him enough for his devotion to Elise and our cause. How cool is that? Team Elise has been represented in THREE (U.S., Canada, and now Portugal) counties now. The only question is, where to next??? To the moon and beyond!! I'm excited for Team Elise, but just as excited for all of us! We all benefit from your great friends, and for that I am extreamly thankful! Well YOU KNEW I WOULD COMMENT LOL!!! This is FANTASTIC. My fellow country-men ROCK - OH YEAH! Go Team Elise!!!! That is so cool! Go team Elise!! We all need friends like that! Very cool. I hope I can grow my team like that also. Wow, that's incredibly cool! Go Team Elise! That is so awesome!!! You guys are INTERNATIONAL!!! Cool!